Chinese manufacturers Xiaomi are set to announce the launch of a new product line for the Indian market. The line is said to be a camera-centric one, which may be a clue as to Xiaomi's ambition to completely dominate the Indian market by taking even more of OPPO and Vivo's market shares. Xiaomi is set to announce the launch of a new smartphone line in India, according to reports by various sources, with the new product line expected to be a camera-oriented one. Xiaomi's rise to dominance has been nothing short of incredible, as the company has grown to become the fifth largest smartphone company in the world—behind Samsung, Apple, Huawei, and OPPO—just six years after it released its first smartphone in August 2011. The company's model seems to be built on producing high value-for-money phones, a model best characterized by the highly-successful Redmi budget line. Not much is known about the upcoming line except the fact that it will be selfie-centric, which may be, perhaps, a sign that Xiaomi is looking to cash into the camera-oriented market that's mostly dominated by OPPO and Vivo in India at the moment. Xiaomi, second largest smartphone manufacturers in India, have a strong grip on the market, with only leaders Samsung offering anything in the way of resistance. OPPO and Vivo follow behind, however, and this new product line could be Xiaomi's attempt at taking over the BBK Electronics' subsidiaries' market share, and cementing its place at the top of the Indian market. The company released the Mi 5X a few months ago, and marketed it as a camera-centric device, so there's a chance this new line is an offshoot of the mid-ranger. This is bearing in mind that the Mi 5X's release was preceded by rumors of another new product line, Lanmi. As such, the possibility of this new product line being the same as the "Lanmi" one from a few months ago is quite high. 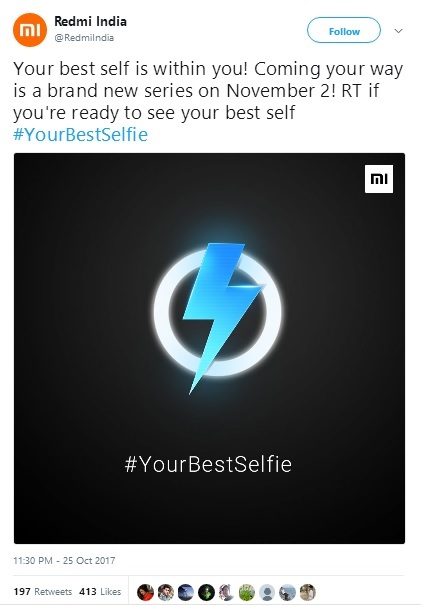 There's also a chance that this is just another Redmi-based line, as the tweet was sent out by the Redmi handle, as opposed to the general Mi one. It will be announced on November 2, though, so we don't have to wait much longer to find out what Xiaomi has in store.